Give your seating situation the boost it needs with the Humanscale Liberty Drafting Chair, which offers the same ergonomic features and comfort as the Liberty Chair, with an even greater height range and a foot ring for use at a drafting table or standing desk. It comes with a supremely flexible 3D mesh back with multiple panels for more contouring and better support where you need it. Comfort and support are right around the corner by way of intuitive adjustments that are made possible sans locks and levers, adjusting with your body as you recline. With no tension springs to adjust, no recline locks to set or release, and no external lumbar devices to mess with, you get a chair that ideally fits to you. Adjusting the Liberty Drafting Chair is easy, simply sit in the chair and move to your preferred postures, while the intelligent counterbalance mechanism gives you the proper support no matter your size or weight. Stylish to the core, the Liberty Drafting Chair is one office addition to get you to your perfect working height quickly. The Liberty arms are very unique. Aside from several different armpads to choose from, fixed or adjustable arms are available as well. The height adjustable arms lower down to the seat cushion and out of the way while working at a desk or on a keyboard tray. The frame of the Humanscale Liberty Drafting Chair is available in black, silver, or polished aluminum. Choose between black or silver trim on the silver or polished aluminum frames. 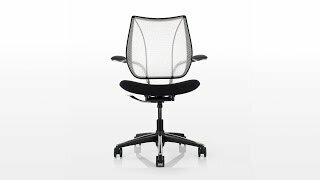 The backrest of the Humanscale Liberty Drafting Chair is available in the following mesh styles. Please note that certain meshes may cause a longer lead time than others. To check lead time on a certain configuration, please give us a call at 1-800-531-3746 before placing your order. Dash is one of the newest meshes available in the Humanscale line. It is characterized by its strength and durability. The luminous quality of each individual monofilament strand creates a translucent effect, while also providing strength and durability. This brilliant weave of monofilament strands and silver-coated yarns offers resiliency combined with a low abrasion factor. Pinstripe offers a simple stripe pattern in a variety of enlivening colors. Catena offers a unique pattern in a variety of modern colors. Pick your seat upholstery from the fabrics and leathers below. Note that the gel seat option is only available in Vellum fabric. The Liberty's thin seat cushion is designed specifically for long-term sitting comfort, whether with the double foam seat or the optional Technogel cushion that maximizes weight distribution and comfort. Both seats are very comfortable, but the gel seat upgrade offers better long-term support and relief of pressure points for users that sit in their chair 8 to 10 hours a day. The Humanscale Liberty Drafting Chair is available with an 18'' or 21'' footring. The Humanscale Liberty Drafting Chair is available with your choice of standard casters, soft casters for hard floors, or stationary glides. $1,019.00 List Price: $1,284.00* The list price is the same as the MSRP (Manufacturer's Suggested Retail Price). It may not necessarily be the price at which the product is sold.